Other than finishing the rocking dinosaurs, most of last weekend and last night’s shop time was spent sharpening tools, including a couple of rehab/initial setup projects. 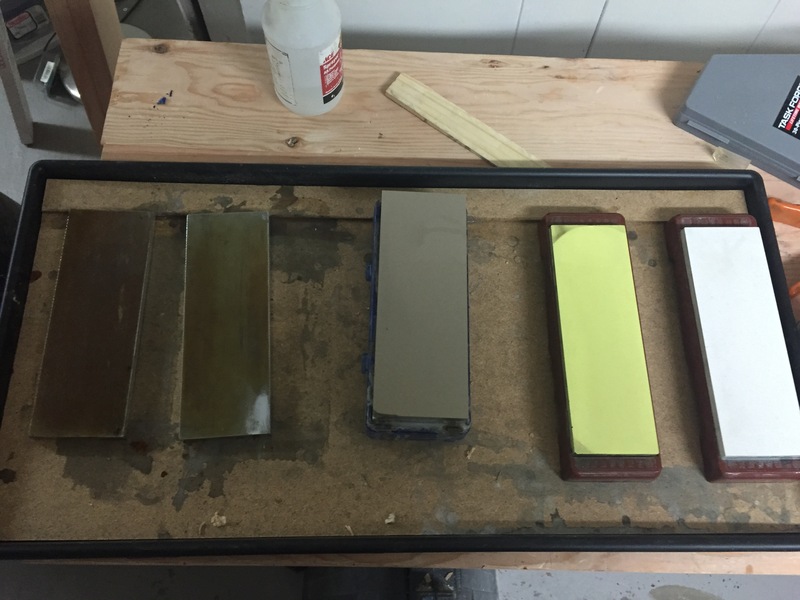 Thanks to the purchase of a boot tray and hardboard base, my sharpening setup is portable and much easier to work with. 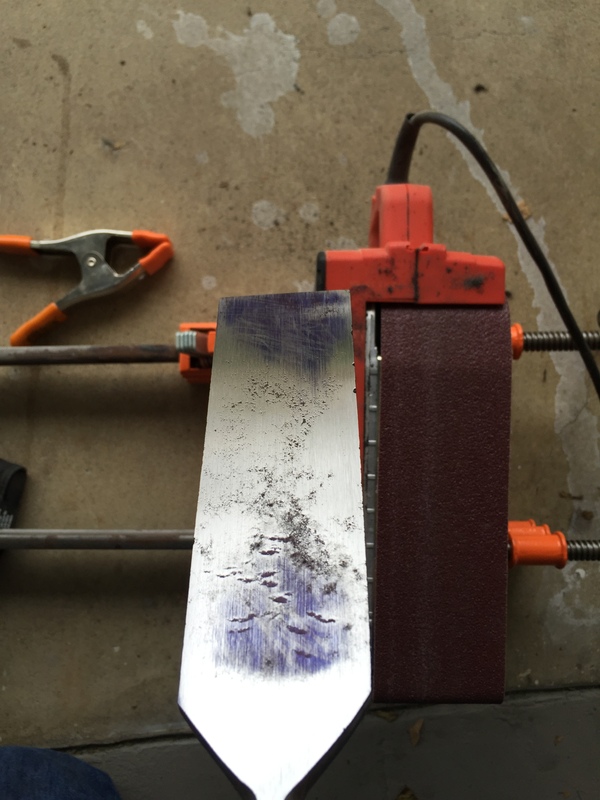 As with most amateurs, my sharpening routine is still evolving but here is what is currently consists of. I use a Veritas honing guide with both the straight and rounded rollers and I do not currently have a grinder, though I have been contemplating buying a hand crank one from eBay. 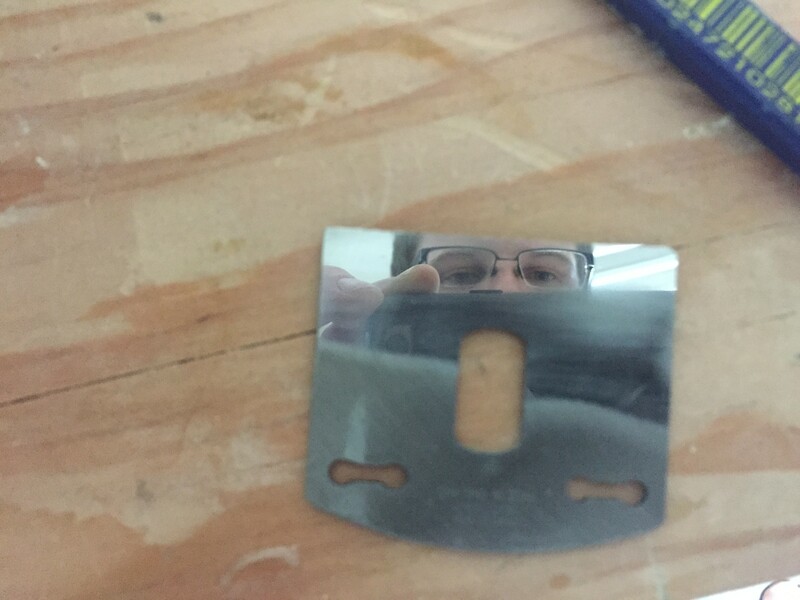 I finally got my Record 65 (courtesy of Patrick Leach over at SuperTool.com) set up by flattening the back of the blade to a minor polish and sharpening a 32 degree bevel edge (there were some nicks and I don’t have a grinder at the moment). 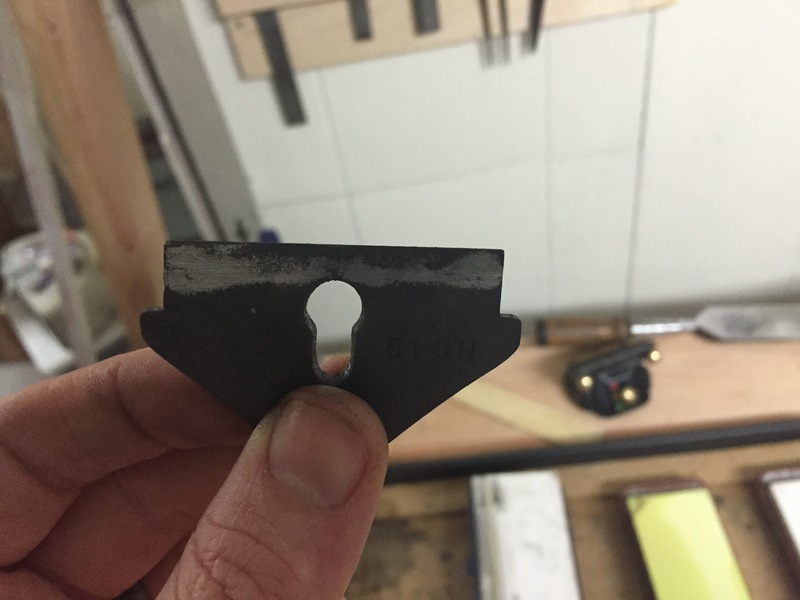 When I started setting up the NOS English made Stanley 151 spokeshave I purchased during Tools for Woodworking’s Cyber Monday event I had a bit more difficulty. 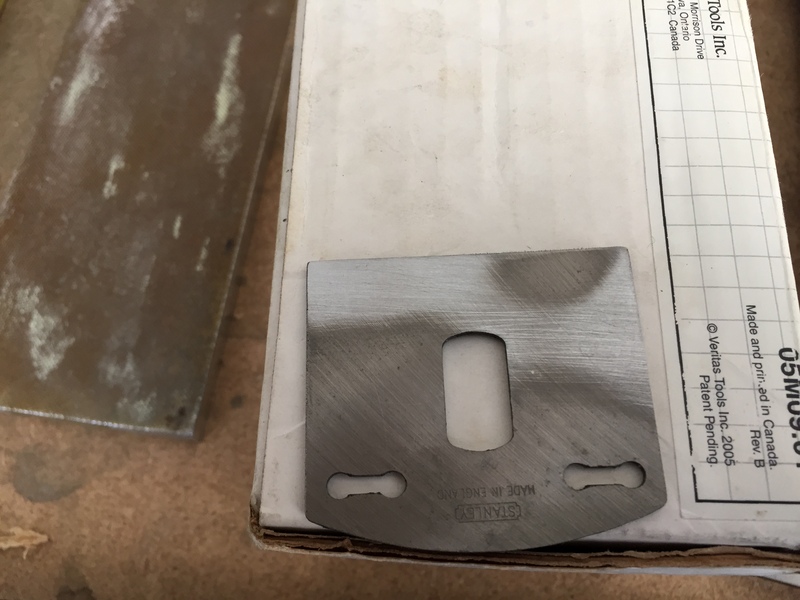 Thanks to a large depression at the tools edge it took quite a while to flatten the back and since the edge is not straight thanks to that same depression I have a feeling making the initial bevel will also take a while. 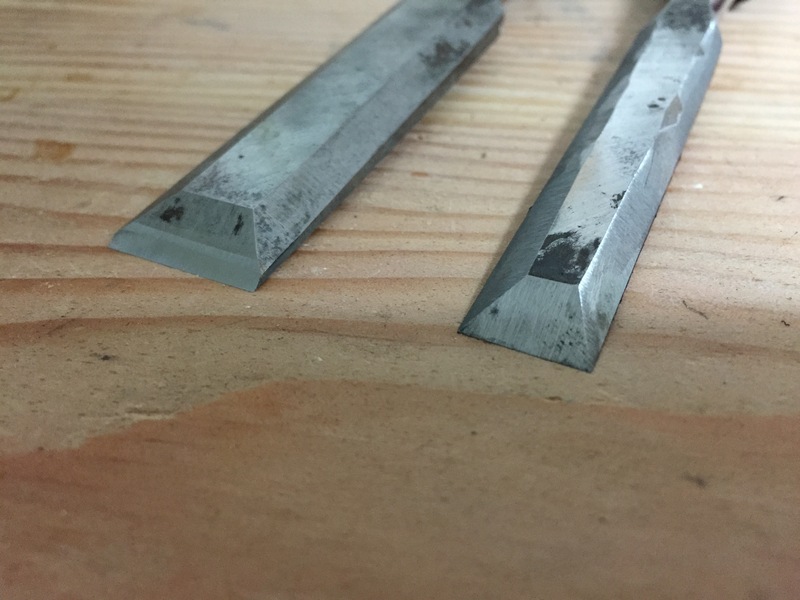 Almost all (except of the two below) of my chisels are now razor sharp and ready for their next project but when I was going through them I realized that my Buck Brothers ½ inch chisel has been put away covered in glue and since I primarily use my Narex ½ inch chisel it sat that way for a long time; rust everywhere. 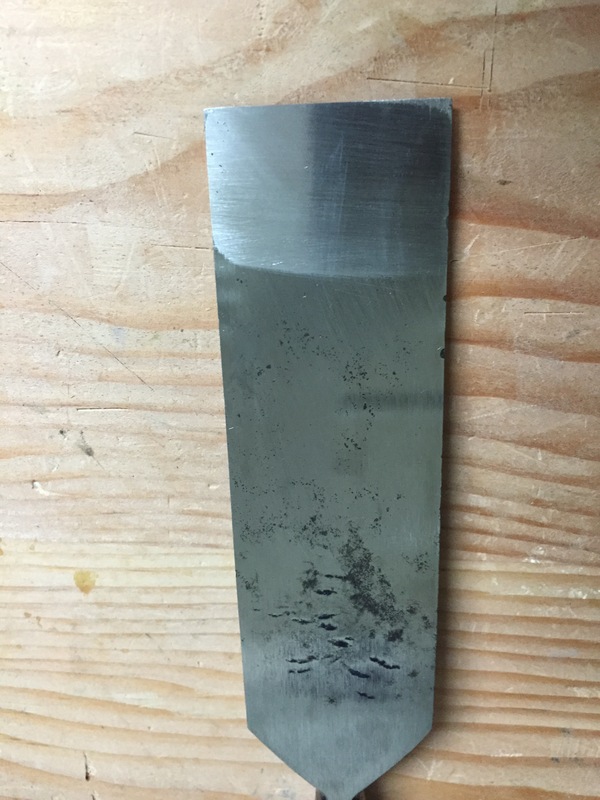 Upon contemplating how to deal with this rusty mess I remembered an older Chris Schwarz post regarding making your own dovetail chisel by grinding down the sides of a cheaper chisel; since the chisel was a mess anyway I decided while I had my belt sander out for the 3 inch chisel I would give it a go. After some time on the belt sander the results are pretty dramatic when you compare it to the ¾ inch chisel from the same set; my next project involves dovetails so we will soon discover how well it works. Last year I purchased several tools from a collector that needed to clear out some space (we met in a grocery store parking lot for the exchange where I purchased the goods out of his trunk) and I am finally getting around to turning some of those purchases into functional users. Amongst those tools was an old 2 inch wide socket chisel which looked like someone had used as a pry bar and there wise abused. This meant the chisel back was quite out of flat and since I want to use to for cleaning up the leg mortises on my Rubo style bench I decided to flatten the back using my belt sander. 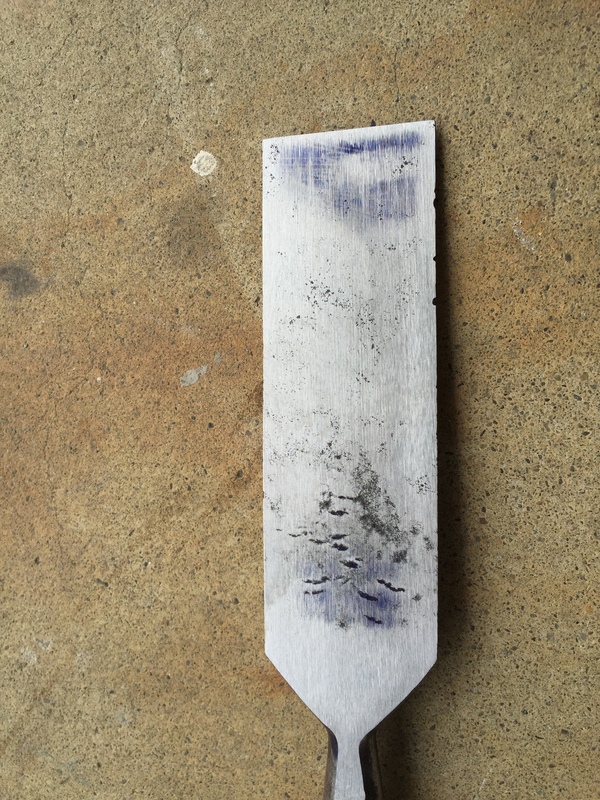 After a few minutes of work I started to mark the back with a pencil and then remembered the Marking Fluid I bought for saw sharpening; the blue fluid quickly showed where my high and low spots were and once the blue areas moved away from the edge I swapped to the 140 grid diamond plate. After a couple of hours I ended up with a fairly good surface near the edge however one corner must have caught the belt and left and low spot.